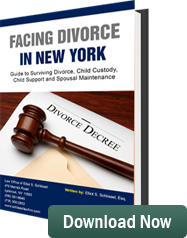 In the State of New York, the distribution of assets accumulated during the course of a marriage is dealt with under the theory of equitable distribution. If the parties cannot amicably resolve issues concerning their assets in a divorce, the assets of the marriage which include, cars, houses, personal property, cash, investment assets, pensions and retirement accounts, are equitably distributed by a judge. The equitable distribution of retirement assets, pensions, 401(k)s, 403(b)s, and IRAs, can be a complicated process. Sometimes these assets need to be evaluated by a pension evaluation firm or an actuarial firm to determine the portion of the pension asset which was accumulated during the course of the marriage. Retirement accounts the parties accumulate during the course of the marriage are considered marital property subject to equitable distribution. This is true even if only one spouse has a pension and the other spouse didn’t work. When there are retirement assets such as pensions, 401(k)s, or 403(b)s, which accumulated during the course of a marriage, it is necessary to obtain a Qualified Domestic Relations Order (hereinafter referred to as a “QDRO”). The purpose of a QDRO is to provide the administrators of the retirement asset with a breakdown as to how the benefits shall be paid between the employee and the non-employee spouse. QDROs also eliminate, minimize and/or distribute, the taxes that are to be paid between the parties when the deferred compensation assets are received. QDROs are very complicated court orders. The process to obtain a QDRO usually involves providing a pension analysis firm or actuarial firm with all of the necessary financial information related to the pension or deferred compensation plan. These firms analyze the portion of the asset accumulated during the marriage and the portion accumulated prior to the marriage. After clarifying this information, they draft the QDRO and forward it to the attorneys for the respective parties. The attorneys thereafter check the QDRO to make sure it is accurate and submit the QDRO to the judge handling the divorce for his/her signature. After the QDRO is executed by the judge, it is served by the attorneys on the administrators of the retirement accounts referred to in the QDRO. QDROs are important to see to it that the parties to a divorce obtain the retirement benefits they are entitled to. These benefits will become very important down the road when they will help pay for living expenses during the respective party’s retirement.